The message of Evangelist is one that is markedly different from what we are hearing at the present time. Because I am Pentecostal, that is where the greater concern of my thoughts comes from. The trends in preaching seemingly focus on deliverance, miracles, signs, and wonders and a host of sensational things. In fact, I was recently a little taken aback by some sensational activities taking place after a health, wealth, and prosperity message that had everyone tossing their shoes onto the platform. Where are the pastors, preachers, teachers, and even prophets who are encouraging personal godliness, a hunger for holiness, instruction in prayer, and deep teaching of the Word that marked our movement decades ago. We have reached a place of incredible shallowness which is demonstrated in the massive lack of discernment among us. Instead these character qualities are being replaced with an atmosphere of “worship” that wants me swinging from the chandeliers, operating in the “power gifts,” or the salvation of the masses. What has happened to the simplicity of the gospel and the faithful discharge of the Word? A. W. Tozer once noted that if the Spirit vacated many churches, they wouldn’t even notice because the professional programs have replaced a dependence on the Spirit and the show would simply go on. Evangelist shows us another way to conduct biblical ministry. 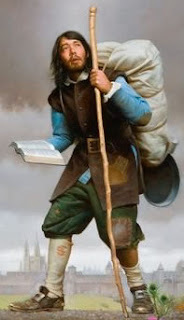 He meets Christian three times during his travels but his influence is prominent all through the story because of the things that Christian often remembers that he had said to him and it helped him to navigate through some of the most treacherous places of his journey. Evangelist does not even remotely resemble the American power evangelist. A power evangelist in America is often loud, flamboyant, and anchored very little to the Scripture. He is the hero of every message he preaches. 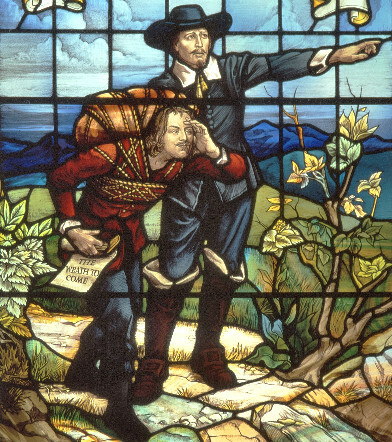 He is adept at wanting to call people out and “read their mail” or have some sensational healing that would seem to validate his “ministry.” That is not the picture that Bunyan paints of his character, Evangelist, who merely does his work in the service of the Kingdom without a lot of fanfare. He just faithfully, loyally, lovingly, and carefully does the work of an evangelist. Evangelist is a man who desires to make full proof of his ministry. He is not a man given to shrewdness, administration, personal coaching, motivational speaking, or slothfulness, he is a man who is steeped in prayer and the ministry of the Word. His first appearance is in the City of Destruction. He is sensitive to the Spirit but he is also sensitive to the needs of the people as well. He frequently walks the fields in and around the City of Destruction seeking people who might be open to hearing his message of the gospel. On this particular day, he finds Christian, who at this point has not been converted, but is greatly distressed over the condition of his soul. Evangelist seeks to understand what the difficulty is and soon is encouraged to find that this man is a sinner in need of help. He tells Christian that he needs to leave the City of Destruction and get on the path to the Celestial City. He points in the direction of the Wicket Gate, which is symbolic of passing through the narrow gate of the new birth, but the sinner whose eyes are blinded by the darkness cannot see the Wicket Gate. Evangelist understands this and instead points him toward the shining lights of the Celestial City which is off in the distance. The sinner can see that and so Evangelist tells him to get the city in his line of sight and the gate will be in that path and he can pass through it and begin the journey. As Christian makes his exit from the City of Destruction, there are a host of characters who want to arrest him from going. We may explore some of those characters later but there is one sinister soul that approaches Christian named Mr. Worldly-Wiseman. He starts speaking to Christian and uses a very liberal and atheistic approach to undo everything that Evangelist has told him. He is preaching a false gospel that is heretical and damning. He is a picture of false teachers who were present in the 1st century and they have multiplied in the 21st century. So, Evangelist comes up to Christian and again you observe the pastoral roles that come out. Evangelist has formerly been a clarion to call Christian to salvation but now he will fill the role of teacher, apologist, and polemicist. The role of a teacher is an obvious one that the pastor must be able to fill. However, he also must be an apologist which is a role that answers with a defense when there is an attack on the basic Christian doctrines. An apologist fills a role that it crucial but it requires the hard work of study because the Scriptures are the reservoir of where we gather our material in defense of the gospel. The role of a polemicist is a bit different in that he does not defend but rather he attacks the false position. If the church will survive in this world, those who are in ministry must be able to be involved in both of these areas no matter how squeamish we may be about confrontation. If there is a false position, it must be attacked if it is endangering the local church. If there are attacks that come against the apostolic doctrine, it must be defended. The work that Evangelist does in confronting Mr. Worldly-Wiseman is both a building mode (as an apologist) and a battling mode (as a polemicist). We are called as ministers to have both a sword and trowel in our hands as we build the local church. The man who shrinks back from this is not doing his job. More and more as we engage in social media regions, we cannot be afraid to confront error and defend truth even though it may cost us our reputations. The last entrance of Evangelist comes directly before Christian and Faithful make their entrance into Vanity Fair. Before they descend into that hellhole, Evangelist once again finds the travelers with another angle of pastoral ministry. At the moment, none of the travelers, including Evangelist, know that Faithful will be martyred in Vanity Fair. Evangelist is working to nurture them but his voice takes on a strident prophetic tone. He does not think of the two converts as notches on his ministerial gun of accomplishment instead the interaction between the three gives us insight into how a very concerned pastor would conduct himself. There are some in the ministry and in the pews who do not see the necessity of a pastor having input and association with the members of the church on matters of spiritual priority as they navigate through a modern-day Vanity Fair. Evangelist was aware of the enticements, the temptations, the dangers, and the huge number of voices that would be calling out to them in Vanity Fair and he was deeply disturbed about their success in making it through. He offers some very strong spiritual medicine—Deny yourself; take up your cross; and set your face like a flint. There is a striving to enter the strait gate. He did not want them to let anything on this side of the world to get into their soul. There are a few observations that can be brought out from our look at Evangelist. Evangelist was an evangelist. It is still crucial for those who are involved in public ministry of the church to be interacting with the lost. We cannot afford to ever come to a place to think we are immune from efforts at reaching the lost through personal evangelism. Evangelist was a teacher, an apologist, and a polemicist. This role has been greatly sacrificed in our generation because of the time commitment required to study the Bible. It is crucial for ministers to do more than read the Bible, they must STUDY the Bible. That means time commitments, study plans, reading commentaries, and working with words in sermon outlines, Bible study topics, and even the hard work of writing. If you would stretch your soul, you must stretch your mind. Make it a point to preach through long segments of Scripture so the church you pastor will be able to know the Word. When I grow in the Word, the church I serve grows in the Word. Evangelist was a prophet. 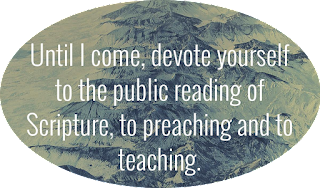 The preacher/teacher must deal with the hard sayings of Scripture. We have to be willing to move through the passages of Scripture that promote godliness even at the expense of offending the tares that hide in the church. We have a biblical mandate to be very plain-spoken, prophetic, authoritative, and no-nonsense. This is not a blanket covering for meanness! But we have to show them Christ and it is important for us cause men to look to their hearts and how the world affects them. Evangelist was a holiness preacher. The preacher/teacher must be a holy man. There are some among us who want to disassociate themselves from being called a holiness preacher, a holiness church, or a holiness lifestyle. But if you will do any work of ministry there must be a great element of holiness about what you do. What is at stake here is the condition of the pastor’s soul, he must be a godly man. . . he must be a holy man. What is it that makes us so embarrassed about being called a holiness preacher and a holiness church? I understand very clearly some of the cultural associations that come with such terms but at the same time, I know that early church in the first century were looked upon as the scum of the earth. Can I expect anything different as I walk through this wilderness?